The Man Of Steel returned to the television screen in time for his 50th Anniversary in 1988, in a series of popular but rarely re-shown exploits. Featuring epic storylines and well above average production values, these are Ruby-Spears’ adventures of Superman! Although I retained a distinct passion for theatrical animation in the 1980s, its television equivalent had much less of an effect on me, unless it was Disney’s Wuzzles, or Duck Tales. I had been a little too old for the toy boom early in the decade, many of those shows attempting to sell me merchandise I was just not interested in, and by the time some of the better action programs came along later, I was a teenager in school, staying on after classes for extra work (hey, I was good like that, not that it’s actually helped me in adult life!) and missing the afternoon shows, though I remember Fantastic Four and Spider-Man And His Amazing Friends being favorites. For some reason, I never really returned to the medium, and even now the animated series I try to catch regularly are adult themed comedies such as South Park or Family Guy. Which makes me kick myself when I realize all the good stuff I was missing, such as Ruby-Spears’ Superman from 1988, the last animated incarnation of the Man Of Steel to land on DVD. Superman had been animated before, of course, the Fleischer brothers’ studio realizing him on film not long after his comic book debut in 1938. The Fleischer, and later Famous Studio, Superman series for Paramount took off in 1942, and was a landmark in terms of pretty much everything, from its ultra art deco styling and sincere tone, to strong, and serious, comic book writing and its realistic human animation. It proved so popular that 17 of the animated shorts were produced, until the advent of World War Two made the Man Of Steel something of a redundant character that was tough to come up with convincing stories for, a problem also faced by the comics. Superman flew again thanks to animation in the late 1940s, when Kirk Alyn took to the skies in two theatrical serials, the second of which, Superman Vs. Atom Man, was actually very good. If you can suspend disbelief, the scenes where Big Blue leaps up, up and away and briefly becomes an animated character are greatly charming and are truer to the character than the same trick being played out years later, when the Man Of Steel became a rubbery CG effect in the painfully awful Superman Returns. The Alyn serials proved popular enough to translate the character to television, where George Reeves played Clark Kent and his super alter ego for no less than six fun-packed seasons. The budgets were low and the animation-free effects often cheap, but it somehow didn’t diminish the appeal of the character, with enjoyable writing and good characterization making up for any shortcomings. The same can be said for The New Adventures Of Superman, his return to animation, though light years away from the quality of the Fleischer series. The New Adventures was devised by Superman’s publishers as a way to keep him on screens and the fledgling Filmation Associates, a studio known more for its backgrounds than its personality animation, famously created the air of a busy, working facility that could churn the program out. Filmation landed the series, and over the next two decades, along with their rivals Hanna-Barbera, created multiple variations of super-heroics, including The Superman/Aquaman Hour Of Adventure, The New Adventures Of Batman, The Batman/Superman Hour, Super Friends, The All-New Super Friends Hour, World’s Greatest Super Friends and, well you get the idea. When director Richard Donner’s Superman: The Movie blasted on to screens in 1978, Superman reclaimed the screen as his own, proving to be a big hit in three sequels of diminishing creative ingenuity until the ill-fated Superman IV: The Quest For Peace (still more true to the character than Superman Returns, did I mention that was painfully awful? Oh, okay…moving on…) had its post-production budget slashed half-way through filming. Superman IV, originally envisioned as an epic just as big (and long, at a reported 130 plus minutes) as the previous films in the series, was eventually released at under 90 minutes, many of its sequences left on the cutting room floor, though in the ensuing scuffle, it did mean Warner Bros, who now owned DC Comics, were able to buy back the rights. Hoping to cash in on the predicted high hopes for Superman IV, DC put their Man Of Steel to work quickly on the small screen, developing Superman with the Ruby-Spears studio, one of the many television animation companies that had sprung up as competitors to Hanna-Barbera and Filmation during the 1970s TV animation boom. Originally members of the editing team at Hanna-Barbera team, Joe Ruby and Ken Spears moved into the writing department, and are now rightfully credited as the creators of Scooby-Doo among their other achievements at the Studio. They both contributed to the more serious animated science-fiction series of Planet Of The Apes (Spears as story consultant on a handful of episodes) before launching their own company, an early success being the made for TV movie Scruffy, directed by Disney veteran Charles Nichols, who had met Ruby-Spears when they had all joined Hanna-Barbera after theatrical animation faltered in the 1950s. Scruffy, though produced in limited animation to television budgets, was intended as a one-off episode of ABC’s Weekend Specials, but a dramatic tone, reminiscent more of Bambi and Lady And The Tramp than the typical Saturday morning cartoons, a longer than usual length, and sterling vocal performances from another Disney stalwart, Hans Conried, among others, gave the film life outside of its television airing and it became something of a cult hit on home video, where it still has many fans today. Aside from the occasional breakout hit like Scruffy, Ruby-Spears’ bread and butter work, like their old employers consisted of the usual action, comedy and comic book characters, as reflected in their popular shows The Plastic Man Comedy/Adventure Hour, Heathcliff and Alvin And The Chipmunks (1983-87) and less palatable outings such as Mister T, Chuck Norris: Karate Kommandos, Rambo and Police Academy: The Animated Series, which go some way to explaining why I wasn’t glued to my set back then! And then, in 1988, came Superman. Clearly intended to follow on the heels of The Quest For Peace from the year before, Ruby-Spears’ take may as well have been called “Superman: The Christopher Reeve Movies Animated Series”, though granted that is a bit of a mouthful. However, with phrases from John Williams’ instantly recognizable Man Of Steel theme weaved into the opening score, and a Superman design that is decidedly closer to Reeve than the comics, especially when under the guise of mild-mannered reporter for a great metropolitan newspaper Clark Kent, that’s clearly the aim, no doubt intended to keep big blue on our screens until another movie could come along. Unfortunately, Quest For Peace ended up being more “Quest For Pieces”, dragging Superman down with it for a short while. But this animated series, also coming coincidentally in Superman’s 50th Anniversary year, deserves to be remembered alongside the better Superman output, since it deals respectfully with the character and even manages to insert some unique aspects as yet unexplored in any other screen incarnation. Each 24 minute episode contains a lead Superman adventure of around 19 minutes, pitting Supes against a number of his greatest foes, including a memorable Lex Luthor and some that hadn’t been seen on screen for a while, if at all. A lot of this continuity is down to engaging authentic DC Comics writer Marv Wolfman as head of the story department, and veteran character designer Gil Kane, resulting in not only a consistency through the series, but between other screen versions. As I mentioned, Saturday morning cartoons left me somewhat unimpressed back in the day, but what struck me about discovering this series was the non-comic approach; these stories have actual plots, sometimes fantastical they may be, and there’s a level of maturity to them that feels, to me at least, to be a clear precursor to the later Bruce Timm editions of the Justice League and, coming full circle, Superman: The Animated Series. Superman himself is comfortable in his world’s guardian role, while Kent is developed a little more as a personality, with nice nods back to the Supermen serials of old. The main title restores the “faster than a speeding bullet” narration introduced on the radio and Fleischer cartoons, while composer Ron Jones follows the Williams template with a triad-based fanfare that sings “Superman” just as Sammy Timburg’s theme for the Fleischers, the Adventures Of Superman and Williams himself did. In fact, Jones is an essential part of what makes these Superman episodes so much fun. A television animation veteran after his staff composer gig at Hanna-Barbera for several years in the late 1970s, Jones moved into live-action with music for such action staples of the 1980s as Magnum, PI and The A-Team before co-scoring the first four years of Star Trek: The Next Generation and Disney’s Duck Tales. Superman came right in the middle of this period, but Jones gives it his all, mimicking Williams’ approach with full orchestral scores composed for each episode, including an authentic sounding appropriation of the Can You Read My Mind love theme, some typical Williams Americana for Smallville, and a nice and wily motif for Lex Luthor, reminiscent of the March Of The Villains piece Williams composed for Donner’s movie. Luthor himself, voiced by long-time animation talent Michael Bell (Transformers, Super Friends) appears as the revamped billionaire industrialist that Wolfman and John Byrne introduced in the mid-80s comics (and much as he’s been seen ever since), rather than the criminal scientist from the early comics, movie serial, cartoons and, to an extent, the big screen adventures. But the character again retains a clear line of pedigree from Gene Hackman’s performance in the first two movies, and he’s even accompanied by the very Miss Teschmacher-esque Miss Morganperry (Lynne Marie Stewart), for whom he often shouts for in Hackman’s same style, every now and then sounding just like him in intonation, which is perhaps another reason I quickly warmed to this version. There’s also much to enjoy in the animation which, while understandably nowhere near the full, sweeping movement of 1940s big-budget theatrical animation, is far better than one should expect from 1980s television. It seems the Studio went all out on their Superman to bring in a level of quality befitting the Man Of Steel. It’s true that is a certain amount of limited animation trickery going on, but these shots are fair outweighed by Superman in the air, twisting and turning like a real man in flight as best as the Japanese artists can handle, with much more attention to perspective and fluidity than would normally be accepted, adding an extra layer of production value that probably wasn’t needed but creates that much more quality. On checking the credits, and seeing such names as veteran Disney and Hanna-Barbera director Nichols and designer Duncan Marjoribanks, perhaps it’s not so surprising, but none the less just as welcome. The main Superman stories featured in the thirteen episode run begin with Destroy The Defendroids, introducing us to the recurring figures of Superman (as portrayed by Beau Weaver, taking on the higher toned Reeve attributes for Clark Kent and baritone heroics as the Man Of Steel), a contemporary comic-book styled intrepid reporter Lois Lane (Ginny McSwain), Daily Planet editor Perry White (Stanley Ralph Ross, a Great Caesar’s Ghost closer to Lane Smith’s later portrayal in Lois & Clark more than anything) and, of course, Luthor, with a fresh bunch of Hackman-esque quips. Fugitive From Space, By The Skin Of The Dragon’s Teeth and, especially, Cybron Strikes are all good adventures, while Luthor discovers Clark Kent’s true identity in The Big Scoop, a storyline I’ve always loved when its been explored elsewhere. The Prankster turns up for a Triple-Play and, very excitingly in The Hunter, the Chris Reeve movie connections are firmly cemented by the appearance of none other than General Zod and another group of villains who create a deadly shape-shifting foe from the Phantom Zone. Another surprise was to see a formidable female friend aiding the Man Of Steel in Superman And Wonder Woman Vs. The Sorceress Of Time, where both team up to save Paradise Island. The power of Magic has always been a threat Superman has trouble getting to grips with, and Bonechill explores another angle along those lines, while The Beast Beneath These Streets and Wildshark are standard-issue but exciting thrillers, and Luthor inventing a “shadow-suit” in Night Of The Living Shadows is a nice twist. Finally, Lois and Jimmy are abducted by an alien in the silly but entertaining series closer The Last Time I Saw Earth. Uniquely, the remaining length of Ruby-Spears’ Superman program was filled out with an ongoing series of sequences chronicling the boy of steel’s growing up in Smallville with Ma and Pa Kent (and it’s lovely to hear veteran voices of Alan Oppenheimer and Tress MacNeille again). This was quite a departure from the usual norm of syndicated television animation, which was usually designed to be shown in any order (and usually was), since each of these four-minute segments were sequential, and bridged each episode by showing young Clark growing up and discovering his powers as the series progressed. Although naturally nowhere near the complexity of the live-action Smallville series, these snapshots of life from Superman’s Family Album, as they were named, do seem to have informed some of that later show (Jones’ score, for instance, pre-dating some of composer Mark Snow’s themes), and really set Ruby-Spears’ program out as something different. The titles of these moments pretty much say it all: The Adoption, The Supermarket, At The Babysitter’s (though not as destructive as Jack-Jack Attack! ), The First Day At School, Overnight With The Scouts and The Circus all being self explanatory depictions of Clark’s formative years. In The Runaway, a lonely young Clark learns an important life lesson and begins to feel like he can fit in on Earth, leading to a frolic filled The Birthday Party, The Driver’s License and a nervous First Date with miss Lana Lang. Superman’s Family Album could in fact be my favorite aspects to Ruby-Spears’ program, especially the final few, which foreshadow Smallville the most, with Clark having to control his powers while figuring out whether To Play Or Not To Play football, Graduation and, arriving in Metropolis to make his first appearance as the Man Of Steel, It’s Superman. Alas, Superman was only to run but a single season, and signalled the beginning of the end of the Ruby-Spears studio, though it did continue to turn out occasional specials until 1995, when Joe and Ken took retirement. Superman himself was in for a rough ride over the next few years; with the fourth film tanking, and a strange serio-comic “wedding” to Lois Lane in the comics, the character lost his way there for a while. The Salkind producers, who had led the charge with the big screen blockbusters, directed their aims at television, with the super-cheesy Superboy taking two seasons to really lift off before coming to land with a thud again in season four. Better was the relationship playoffs between Lois & Clark: The New Adventures Of Superman, which brought big blue back to TV in entertaining fashion from 1993 for several successful seasons. Since then, Superman has been more the background rather than the focus of Smallville, the excellent chronicles of the Man Of Steel’s upbringing as a teenager discovering his powers, and the less said about the recent attempt to shade the character with more depth in Superman Returns (did I mention that was painfully awful yet?) the better. But Ruby-Spears’ Superman reminds us when the character was someone to celebrate, and is an interesting middle ground between the typically kid-friendly early ’80s shows and the later, deadly serious approaches from Timm and his team. The stories here have fun with the Chris Reeve approach to big blue, and give his Kent alter-ego things to do other than just rip through an endless supply of shirts, but it’s the Family Album excerpts that really mark Ruby and Spears’ take on the material out as a unique addition to the Super-screen canon, and one that flies high. Always adding some bonus value to their DVDs is Warner Bros, who not only provide all episodes of the series uncut, but thrown in an added featurette, Corruption Of The Corrupt: The Rise Of Lexcorp that ostensibly focuses on Luthor’s transformation from criminal mastermind to the head of criminally profitable company Lexcorp. I say “ostensibly”, since this is really quite a peculiar 13 minute piece in 16:9 that has scant all to do with Lex, but keeps trying to shoehorn him in as a symbol of 1980s corporate American greed. The most disappointing bonus supplement in any set from any distributor in a long moon, this is a totally out of context discussion of the ’80s “greed is good” culture, and not even a measured and coherent examination, made wildly uneven by the need to keep referencing “Lex Luthor” and “Lexcorp” in a desperate attempt to make some kind of tenuous connection. Just like the theoretical piece on “Man and Superman” found on the Fleischers’ series earlier this year, this misses the mark by a very wide margin and is bad. Just be grateful to have the series on DVD at last, and skip this. If there’s one other thing that strikes against the set, it’s the episode encoding. Each one has been chapter indexed at various points, but there’s no way to watch an entire episode of both the main Superman story and the Family Album segment in one sitting, since each has been sliced up. The only way to watch them as originally intended is to hit the Play All option, but if you want to catch a later episode, there’s an awful lot of chapter skipping to be done before you can reach the right start point. Much simpler would have been to simply let the main story, if selected, run into the Smallville segments, so that complete episodes could be watched as they originally ran. The first disc begins with two previews for other Warner action/animation releases, specifically a lengthy look at Star Wars – The Clone Wars: The Complete First Season and Superman/Batman: Public Enemies, with an additional trailer for Green Lantern: First Flight optional from the bonus features menu. Previews for Batman: The Brave And The Bold, Harry Potter Wizarding World DVD Game and a booming Secret Saturdays are featured on the second disc. 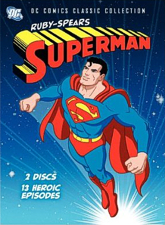 As another in the DC Comics Classic Collection, Ruby-Spears’ Superman comes in a standard DVD case, covered by replicated sleeve art on an outer, “book” style slipcover. While some of the DC Collection packaging has wavered from this presentation, most sets follow this approach, and at least this edition matches its closest companion, the Max Fleischer set from earlier this year. The cover art is neat, the front and back repeated on each of the two discs. Looking about as good as can be expected for composite video from the 1980s, Superman was obviously shot to film (most probably 16mm) and likely mastered to Betacam for broadcasting. As such, the film elements are as clean as they would have been in 1988, meaning a fairly decent if not spotless image, which seems to have undergone at least a quick wipe to remove any crosstalk. The color is pretty robust, too, though it could have perhaps done with being a little desaturated, if only to prevent a bit of spillage around the lines, but it’s vibrant and steady across all the episodes nonetheless. If I haven’t praised Ron Jones’ scoring enough, let me just say again here that you could do without the spot effects in Superman and still have great fun. The voices add to the mix, and come prepared to jump into the characters as we know them, without any new vocal tricks or surprises. Everything is as it should be in Smallville and Metropolis, and these mini-movie soundtracks are so dynamic that I forgot they were only in mono! English and French subtitles are also optional. I love the character, and I love this 1980s animated television version of him. Ruby-Spears’ Superman respects our hero and, though it serves up the usual fights and flights required of such Saturday morning actioners, it does so with panache while retaining a semi-serious approach. I must admit that a great deal of the goodwill felt towards the series came from Jones’ music, which occasionally is so close to Williams’ iconic score from Donner’s original film that one would swear it was being quoted more than it is. I was genuinely surprised by the rather production value, and the writing and vocal performances are good too. There are some nice crossovers from other Superman screen incarnations, and the chronological Family Album segments are a unique icing on a genuinely super cake! This entry was written by kelvin, posted on November 27, 2009 at 12:00 am, filed under Animation. Bookmark the permalink. Follow any comments here with the RSS feed for this post. Trackbacks are closed, but you can post a comment.